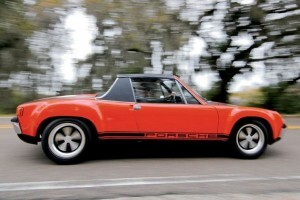 When we picked up our little 1973 Porsche 914, she looked remarkably good and fairly correct. I was having misgivings about her potential to become a track car or a 914-6 replicar. Even with steel flares and a 2.7 911 motor in hand, I was having trouble with the idea of molesting a fairly nice, original car. As I poked and prodded, photographed and documented the car, I got the feeling she is not quite as original as I thought at first. Phew. 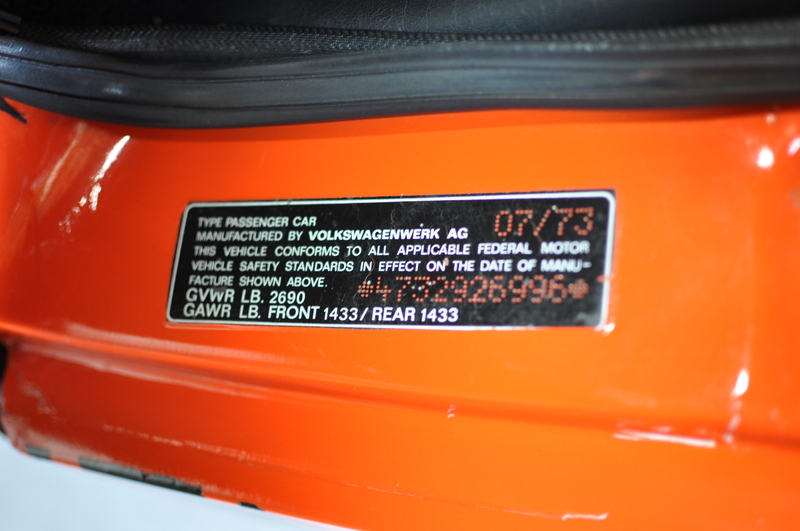 When I saw the paint code on the door card and the name, I thought the color had changed from the original color! Almost had a heart attack. I started poking around for signs of a deeper red somewhere on the car. 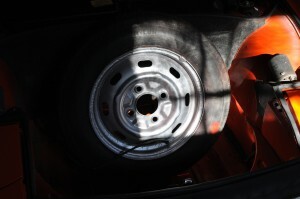 You can usually find it in wheel wells and unlined trunk spaces. 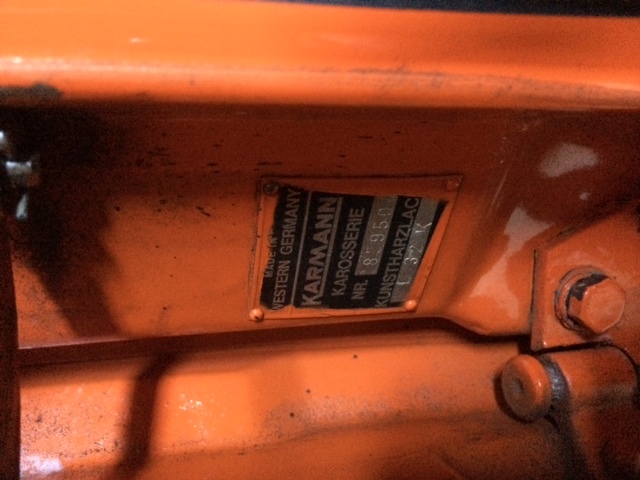 Unless a repaint is incredibly thorough, there is nearly always some bit of the old color showing somewhere. I hadn’t recalled seeing any of those spots so I held my breath until I could do some research. Who knew that Phoenix Rallye Red is really orange? I still don’t think I’ve calmed down from thinking that the car’s color wasn’t original. The name “Signal” may stick to remind me that its a ‘signal’ of how much you need to do research before you actually know anything! Paint code: L32K Phoenix Rallye Red. Which looks remarkably like orange to me. But there are some other curious bits. The speedometer is perhaps the most curious. 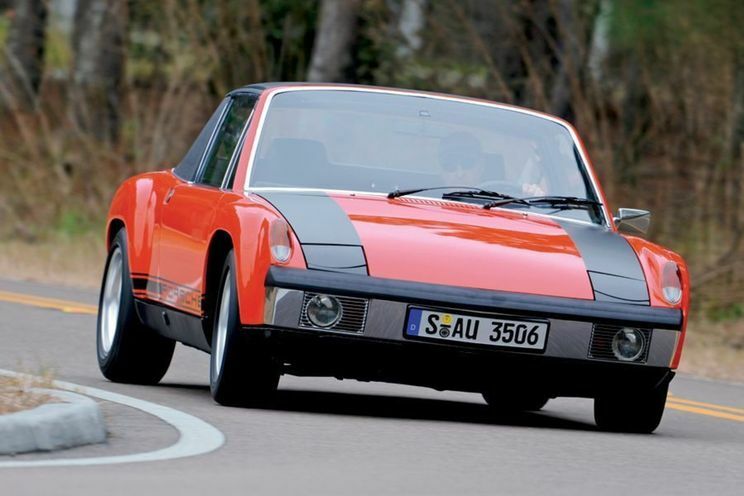 According to my 914 authenticity book (that I just devoured in the past 18 hours), only the 914-6 got speedometers that go up to 150mph. The 4’s are supposed to only hit 120. But ours has a looming 150 in there. Might make the odometer a bit suspect now, no? It certainly can’t hit 150mph and shouldn’t even say so. 120mph top would be more correct. The spare tire also tells a tale. 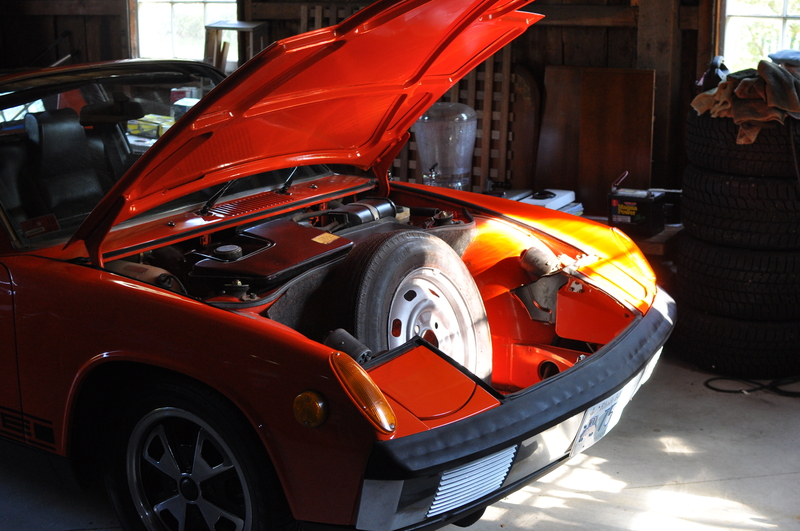 The spares in 914s are supposed to be the same as the wheels on the car. Same tires too. I do love the optional Fuchs wheels that are on the car. But again, not so correct. The spare is a basic steel wheel that would have had a hubcap on it. 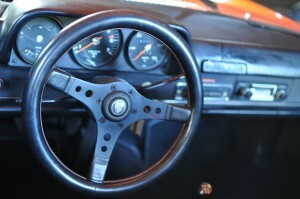 The tires on our car are new and definitely oversized – probably why the speedometer is way off too! – so that was a tip off. At least the spare had air in it which should help with keeping the windshield clean. And it was even hooked up to the windshield washer reservoir! 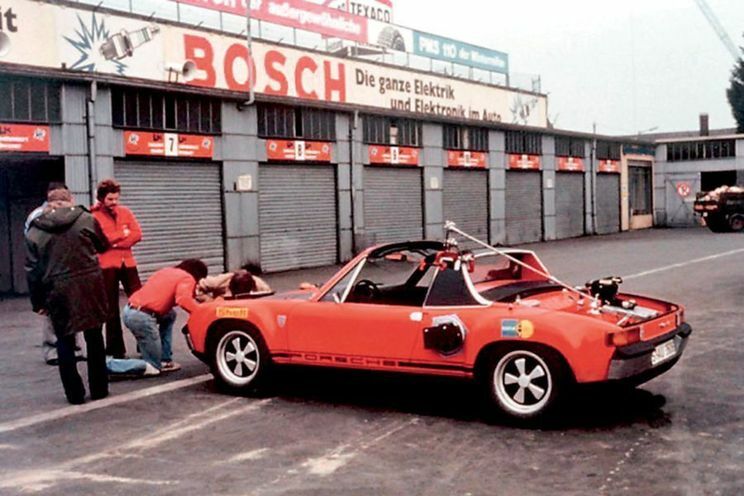 Not quite a match for the Fuchs wheels on the car. Yes, the spare is needed to clean the windshield! 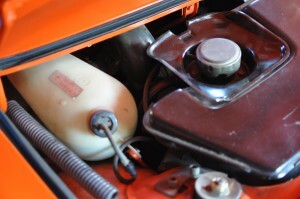 Washer fluid won’t squirt unless the spare tire pressure is good. The interior is pretty clean so I’m guessing that the carpets are replacements, although I don’t know for sure. The radio appears to be either a replacement or it is also possible that the car didn’t have a radio originally. 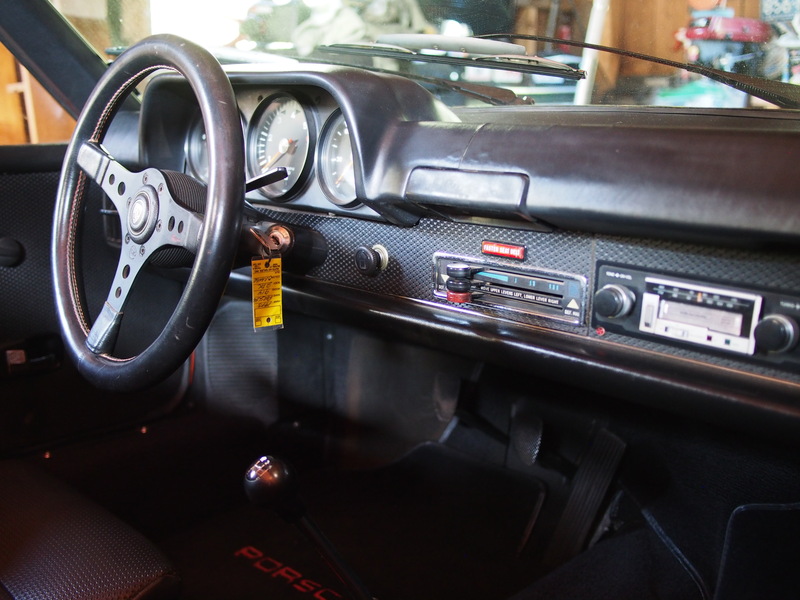 There are correct speaker surrounds in the car, so the stereo may have just been swapped over at some point. It’s still an old cassette deck so at least it isn’t some pop-out-nav-screen eye sore. The radio does not appear to be original. The steering wheel isn’t the original, but we do have that. And I like this one far better for now. So no biggie there. 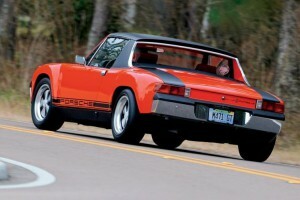 But the big question now is – do we go all 914-6 M471 on this thing? ?